In this paper, Ribaudo et al. provide direct evidence of a possible cold gas stream accreting onto a galaxy. Using Hubble Space Telescope (HST) and Keck spectroscopy and imaging from the Large Binocular Telescope, the authors identify a metal-poor Lyman limit system (LLS) in absorption against a background quasar and associate it with a nearby galaxy at an identical redshift. The authors argue that the observations are consistent with Cold Mode Accretion. Original Caption (Ribaudo et al 2011): Fig. 1.— A small section of a 2.5 ks LBT g-band image of the PG1630+377 field (left). The dashed circle shows a 100 kpc radius (∼ 25′′) about the QSO at z = 0.274. The host galaxy candidate is labeled 296 9 and is a projected 37 kpc from the QSO line of sight (marked with a +). Other galaxies in the field with spectroscopic redshifts are noted. Foreground stars are marked with a star symbol. The LRIS spectrum of galaxy 296 9 (upper right) shows the emission lines characteristic of a star forming galaxy. A portion of the COS spectrum of PG1630+377 (lower right) shows the LLS located at z =0.27395 and the Lyman series lines leading up to the break. The H I column density of the LLS (log N (H I) = 17.06 ± 0.05) was calculated by comparing the estimated unabsorbed continuum flux (upper dashed line) and the estimated mean absorbed flux (lower dashed line). Ribaudo et al. use UV spectra from the Cosmic Origins Spectrograph on HST while presenting optical spectroscopy from HIRES at Keck Observatory. (In Fig. 1, the background quasar is marked with a cross, while foreground stars have been marked with star symbols.) The UV spectra are used to constrain the H I and the lines of other high ionization species that might potentially be present (e.g., C III, Si III, O VI). Meanwhile, the optical spectra are used to measure Mg II. The Lyman break occurs at ~ 1162 angstroms, giving a redshift of z = 0.27395. From the Lyman break decrement (Fig. 1, bottom right), the total H I column density is measured to be log N (H I) = 17.06 ± 0.05. The normalized spectra of the various ions are presented in Fig. 2, but most importantly, the authors measure [Mg II/H] = -1.71 ± 0.06, indicating a very low metallicity. The low metallicity suggest that the gas is extragalactic in origin, rather than associated with a nearby galaxy. In order to get the final metallicity measurements, they model the various ionic species in the gas using CLOUDY (Ferland et al. 1998), which is a spectral synthesis code used to model astrophysical plasmas and interstellar mediums. The results suggest that the gas is almost entirely ionized, consistent with the CMA framework. The authors furthermore suggest that the strong O VI feature, which is not explained by the modeling, is a result of the cold, low-metallicity gas interacting with the hot corona of the host galaxy, whereas the other intermediate ionization species are direct tracers of the cold gas itself. Since the conclusions tentatively suggest that the system is infalling cold gas onto a galaxy, Ribaudo et al. further present Keck spectroscopy of a galaxy at the same redshift as the LLS. Using the Sloan Digital Sky Survey for target selection, they selected three bright galaxies for spectral follow-up (Fig. 1, left). The nearest galaxy in projected space (37 kpc) turns out to have a measured redshift of z = 0.27406; while a second galaxy (140 kpc, projected) also had a close redshift (z ~ 0.277), the authors found that the relative velocity of the second galaxy to the LLS was ~ –925 km/s — as opposed to only ~ –26 km/sec for the closer galaxy — made it substantially less likely to be associated with the LLS. 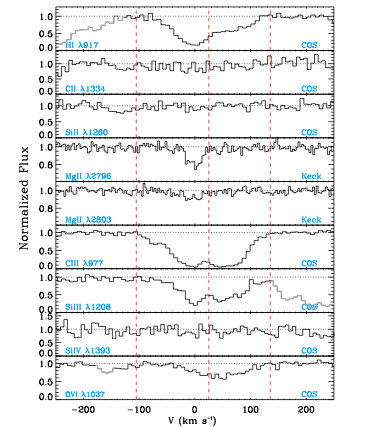 The authors present [O/H] = –0.20 ± 0.15 (nearly solar) for the associated galaxies metallicity. Because this metallicity is substantially higher than that of the LLS, it is very unlikely that the LLS could be an outflow from the galaxy; instead, we are left with the exciting conclusion that the gas is part of a cosmological filament of cold gas. The authors argue that the low number density of dwarf galaxies around larger halos makes it highly improbably that the LLS is a low-metallicity dwarf. Thus, they conclude that the detection is that of a cold, filamentary stream. They note that the literature contains other examples of low-metallicity streams associated with galaxies. Thus, they conclude by suggesting that regardless of the origins of some LLS (some are likely related to galactic feedback mechanisms, such as stars and supernovae), some percentage are likely tracers of cold flow accretion. This paper presents a synthesis of various observational and modeling techniques. It also argues for the association of these low-metallicity, ionized gas Lyman limit systems with those predicted from Cold Mode Accretion theories. If this is true, then as CMA models continue to develop, these types of targeted observations may be able to provide detailed constraints on kinematics and ionization states of this newly accreted gas — which will allow further refinement of the theory. When did massive structures of galaxies form? A Trio of Supernova Fossils One Magnified Starburst Galaxy Astrobites: A Look back at 2016!